The index opened positive but saw profit booking to the lows of the day around 7517 where the responsive buyers took control to move the index back in green and eked out a strong close at 7671.40, huge gain of 116.20 points. The broader market was positive with 930 advances to 624 declines. The range for series is now at 7400-8000. 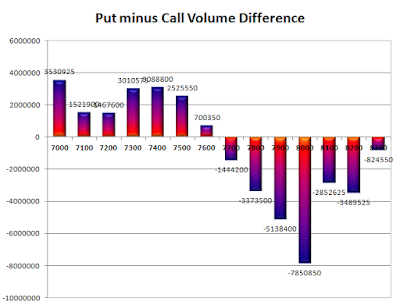 Call option 8000 added 0.22 lacs OI with short covering seen at 7700 and below strike prices. Put option 7700-7400, 7200-7000 added huge 21.23 lacs OI with profit booking seen at 7300 strike price. 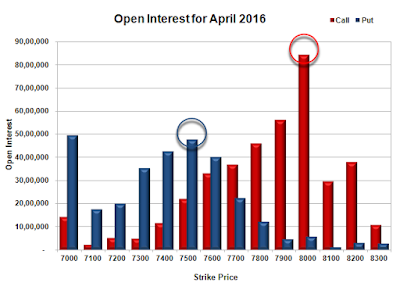 Nifty Open Interest is at 1,53,76,500 down by 3,15,000, with increase in price, most probably short covering. 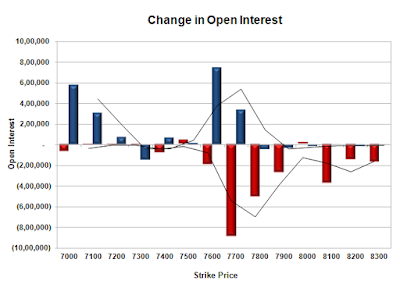 Bank Nifty Open Interest is at 17,36,400 down by 44,280, with increase in price, most probably short covering. FII’s sold 371 contracts of Index Futures, which includes net 685 contracts long build-up and 1056 contracts short build-up, with increase in net OI by 1741 contracts, includes 29307 longs to 29678 shorts for the day. FII’s Index future open contract as on date is 124005 Longs to 97471 Shorts, Net 26534 down by 371 contracts. Initial support at 7600, with OI of 40.14 lacs and below that at 7500 with OI of 47.48 lacs. 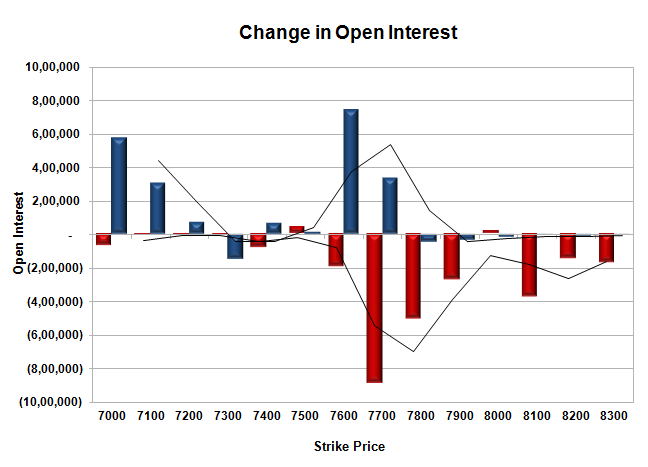 Initial resistance though looking weak at 7700, with OI of 36.97 lacs and above that at 7800 with OI of 45.92 lacs. Day Range as per Option Table is 7563 - 7706 and as per VIX is 7607 - 7736 with 7622 as the Pivot.